Here’s the Brazilian version of the confection we call fudge. It’s named after a famous general and was created in the 1920s when imported sweets were unavailable during the upheaval of the time. 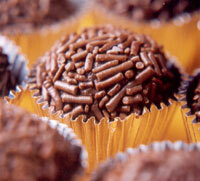 Brigadeiro is one of the most popular confections in Brazil. In a heavy saucepan, mix the milk, cocoa and butter. Stir to dissolve the chocolate. Put over low heat and stir constantly with a wooden spoon. Continue stirring and cooking until you are able to see the bottom of the pot when you tilt the pan (the mixture will just slide quickly). This should take 10-12 minutes. Transfer to a greased plate. Let cool. Butter your hands and roll the mixture into small balls and roll over the chocolate sprinkles. You can substitute the cocoa powder for 100g baking chocolate. If you want a lighter candy use powdered chocolate (such as quick). You can also put raisins or nuts in the center of the candy. You can decorate with powdered sugar or cocoa powder instead of chocolate sprinkles, or just eat it by the spoonful! It does not taste like fudge at all. It is much better! I grew up in Brazil eating these. They make them for b.day parties and such. We still make them at home for no special occasion 'cause they are so great. My sister even had them at her wedding instead of the mints. There were none left over... YUM!!!! As a Brazilian, I would like to praise you for the accuracy of the recipe. This is such a delicious yet simple dessert. No one believes me when I list the ingredients and how easy it is to make. Try it and you will get addicted! Chocolate... what's not to like about it? Love your site. What a great treat! Easy! Fun! and Sooooo Gooooood! i grew up with a lady who made these all the time. you can make plain ones too but you have to be very careful not to burn the mixture! the upside with making plain ones is you can add flavorings and colourings to them. PINK ones are the best. adding small amounts of fresh fruit juice, such as strawberry or raspberry are amazing!! !